← Up From The Grave He Arose! This is a intermediary post in my “No-Shave Experiment” mini-series. The perfect book was just published! Now I don’t have to cobble together research from dubious internet sources on what I want to know about the history of shaving. 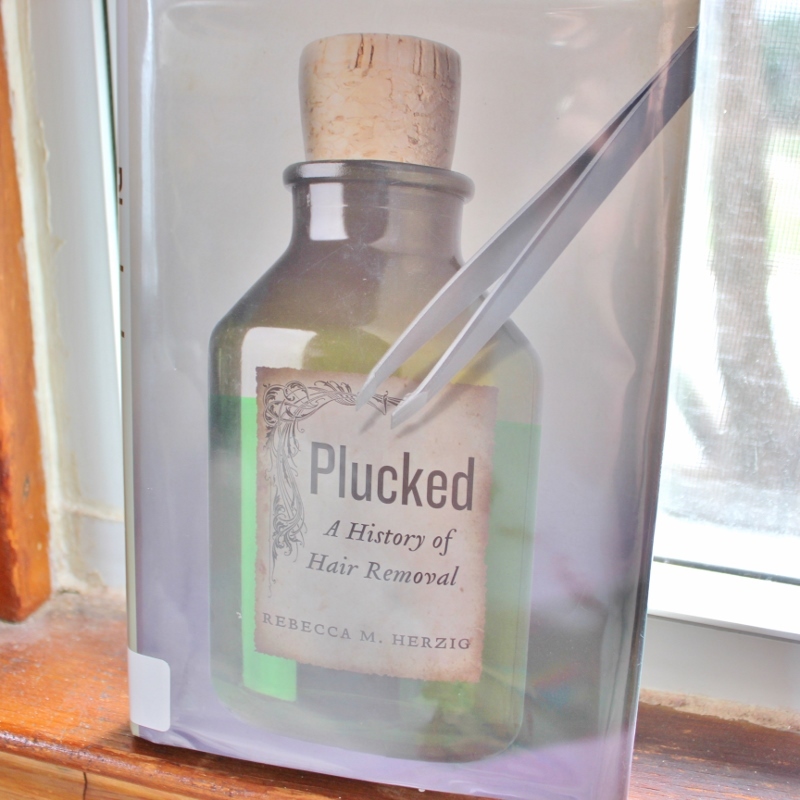 Plucked: A History of Hair Removal is at my house and ready to be read. First I have to write my rant so as to not be tainted by knowledge (HA!). I am already a bit tainted because I listened to the author’s interview on the Midday Show (a local NPR show) and now I’m even more frustrated. In the meantime, I’m interested in hearing from any of you who either currently refrain from shaving or did so for a time in the past. As part of my research, I’d love hear why you decided to do so, what (if any) reactions you’ve had from other people (both those you know and strangers), and how you reacted to your own changing body appearance. I’d like to hear from both women and men. Leave me a comment or contact me using the form below. With your permission and preference about whether or not to be anonymous, I’ll be sharing these stories in a future blog post. This entry was posted in health and beauty, KIOS and tagged no shave experiment, Plucked: History of Hair Removal. Bookmark the permalink. My husband has horrible skin and had constant problems with ingrown hairs and rashes on his face when we first met. Then he quit shaving, grew a beard, I noticed how handsome he was, I fell head over heels and we have our 10th wedding anniversary this month. So quitting shaving may help you find true love! Thanks for sharing that fun story! You’re the second person who has shared “beard=true love” with me! Let’s see. It was in college when I started getting lazy about shaving. I really got so I was tired of getting nicked in the ankle, knees and behind the knees. And then when I’d shave and realize I’d missed an entire swath up my shin or calf. But somewhere in there I decided it was just too much work and I wasn’t bothered with it. I’d shave when I had a reason to look nice, and therefore be well groomed. I should add that my body hair is extremely light; I’m not swart and hirsute, so letting it go was self-consciously easy. Also, after college I went into construction (with AmeriCorps and Habitat for Humanity). Grooming in construction is not exactly a high priority, and so I continued with my lazy shaving. It was when I was dating a fellow carpenter (for whom grooming, and perhaps laundry and most other hygienic practices were low priority) that I quit shaving entirely. I forget how or why I brought it up, but his opinion was that women should shave allthetime, or never. Apparently he didn’t like the in-between stubbly stage. He was not telling me what to do, just offering his opinion on a topic I brought up. And that was all the permission I needed. I’ve not shaved my legs since. That was August 2000, and that means I did not shave for my wedding, nor for the birth of two children, My husband thinks my legs are softer for it. I do shave under my arms when I need to wear short sleeves or go sleeveless, in a bathing suit. That’s my shaving/grooming story. Good luck with the research! Thanks for sharing your shaving story with me!! I’m so thankful to you and everyone else who have shared with me.